Blair and I were invited to a party with my coworkers tonight in Charlottesville. One last weekend before school starts again. Yikes. We chose to take dessert tonight, so I dusted off my cupcake pans and got to work. I followed a recipe from 500 Cupcakes and made just a few changes. 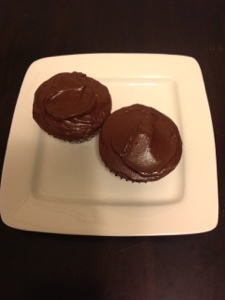 I’m a big fan of chocolate + coffee, so I added some instant coffee powder to the Devil’s Food Cupcakes. I haven’t baked in months, so I felt slow and rusty. But they turned out pretty well. The frosting was my favorite part! Gather your ingredients (see below for full list). 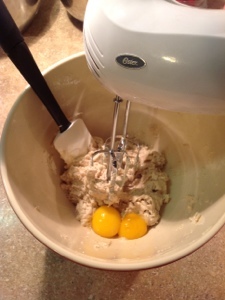 Sift the flour and baking powder together in a small bowl. Cream butter and brown sugar in a large bowl. Add 2 egg yolks and beat well. 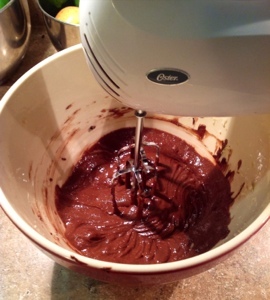 Add melted chocolate and vanilla and mix well. 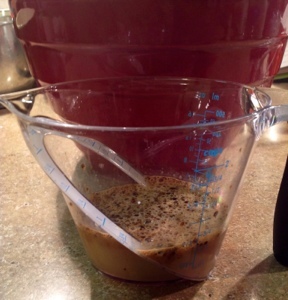 Combine instant coffee and milk. 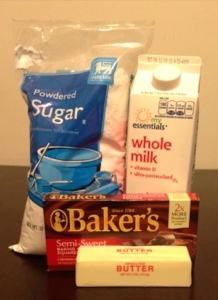 Add sifted flour mixture and milk mixture alternately until well combined. Be careful not to over mix. 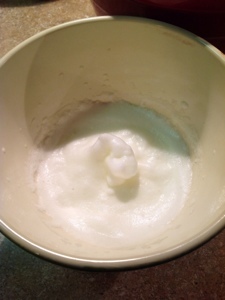 Whip 2 egg whites until soft peaks form. 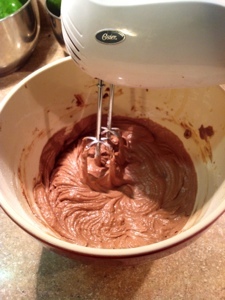 Gently fold into batter. 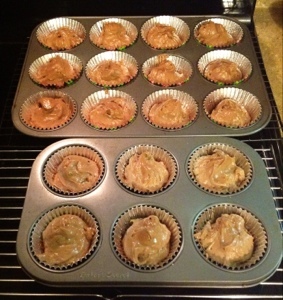 Spoon ~1/4 cup batter into lined muffin tins. Bake at 350F for 18 minutes. Remove to wire rack to cool. 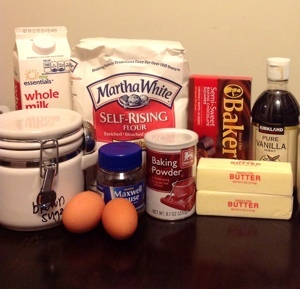 While cupcakes are cooling, mix frosting. Beat butter and milk together until combined. Add chocolate and vanilla, stir well. Mix in powdered sugar. Beat until fluffy. Frost when cupcakes are cool. Share (or not) and enjoy! Preheat oven to 350F. Line 18 muffin cups. 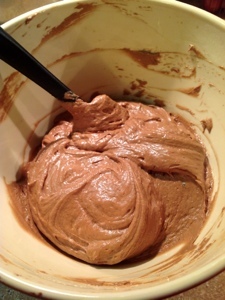 Sift flour and baking powder together in a small bowl. 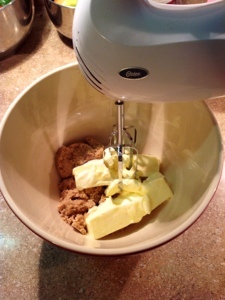 Cream butter and brown sugar together in a large bowl. Add egg yolks and mix well. 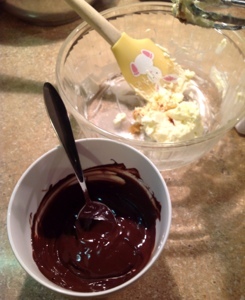 Add melted chocolate and vanilla, mix well. Add flour mixture and milk mixture alternately, until well combined. Beat egg whites in a medium bowl until soft peaks form. 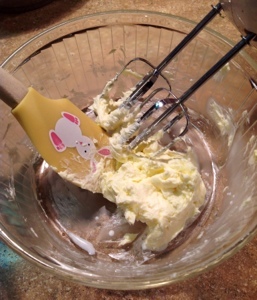 Gently stir egg whites into cupcake batter. 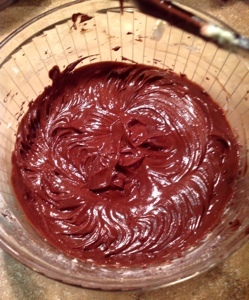 Gently spoon~1/4 cup batter into each liner. Bake 18 minutes, or until toothpick comes out clean. Cream butter and milk together in a medium bowl. 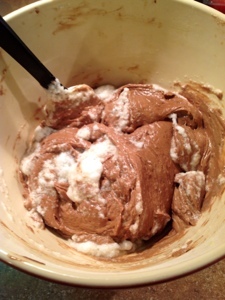 Stir in chocolate and vanilla. Beat in powdered sugar until smooth and fluffy. Spread frosting over cooled cupcakes. Can be stored unfrosted for a few days in an airtight container. Makes 18 cupcakes. Enjoy! Please feel free to share modifications or suggestions to this recipe! 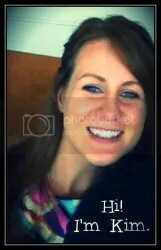 Nice job Kim Crocker! Cute spatula too! They sound very delicious….nothing better than coffee and chocolate….mmmmm! Thanks for taking the time to visit my little slice of the internet. I drink a lot of wine and sometimes write about it. In my spare time, I cook, teach, crochet, garden, and hang out with dogs and chickens. 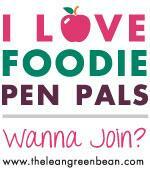 Sometimes I share recipes, wine reviews, and act a little silly. Welcome, and enjoy!